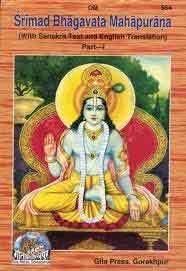 To establish His philosophy of love, Śrī Caitanya made use of Śrīmad-Bhāgavatam, the most exalted scripture which gives and explains the essence of all the Vedas, being the natural commentary of Vedānta-Sūtra. Śrīmad-Bhāgavatam establishes Kṛṣṇa as God of all gods, the primordial cause of everything. Among the living beings He is the only and most suitable recipient of love because He just desires our welfare, eliminates our sorrows, possesses all wonderful qualities and is the Supreme Soul of everybody. Once attained love of Him, we obtain absolute happiness and knowledge, and all the pain gets destroyed for good. This love of God is the supreme goal of human life (prayojana). Śrīmad-Bhāgavatam also shows ideal persons who have this love of Him. They are cowherd girls of Vraja, and they express it through the supreme devotion (uttamā bhakti). Their devotion is an end as well as a means at the same time. In the perfected stage we have it naturally while in the practising stage we need to practise it under the guidance of a realized person, getting united with him in the heart (ekatā) and learning from him how to direct all of our intentions, activities and thoughts to please Kṛṣṇa (ānukūlya). He shows us how to get rid of our egoistic wishes and prepares us for being worthy recipients of transcendental love, connecting us directly with divinity. Thus devotion without a hidden agenda is the means (abhidheya) for achieving love of God. The souls are the same with the Lord in that both are pure spiritual entities, and at the same time they are different because the jīvas are atomic and can be influenced by the external energy, whereas nothing can limit or influence the Lord. He can be compared to the Sun and the jīvas to its rays: the rays are identical with the Sun because they have their origin in it, and at the same time they are different because do not have the same intensity, and are perceived as different from it. Human mind cannot understand how something can be different and non-different at the same time, but this is possible due to the acintya (inconceivable) character of the Lord’s potencies.